The Victoria Cross is Britain’s highest award for gallantry in the face of the enemy. The words “for valour” are inscribed on the face of the medal. 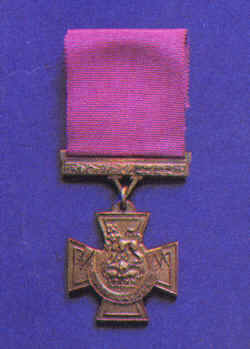 The KAR’s first VC came just nine months after the regiment’s formation in October 1902 when Captain (later General) Alexander Stanhope Cobbe commanding the 1st (Nyasaland) Battalion with the local rank of Lieutenant-Colonel, won the medal by fighting off a Dervish ambush at Erego in Somaliland (modern Somalia). Cobbe Barracks in Zomba, Malawi, once home to 1st (Nyasaland) Battalion KAR and now the Malawi Rifles is named in his honour. 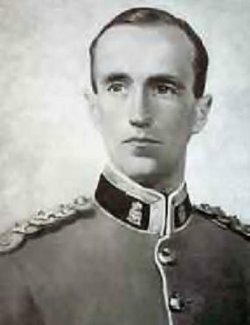 The regiment’s second VC was won posthumously by Kenyan-born Sergeant Nigel Gray Leakey of 1/6th Battalion KAR in May 1941, during the Second World War at Colito in Abyssinia (now Ethiopia) for single-handedly attacking an Italian tank by wrenching open the turret and shooting the crew. He was killed attempting to do the same to a second tank. Colito Barracks in Dar es Salaam, once home to 6th (Tanganyika Territory) Battalion KAR, is named in honour of this battle. A number of officers who served with the KAR were later awarded VCs for their service with other regiments. In 1940 acting Captain (later Lieutenant Colonel) Eric Charles Twelves Wilson serving with the Somaliland Camel Corps – and previously the 2nd (Nyasaland) Battalion KAR – had the rare distinction of winning a posthumous VC for keeping a machine gun firing in the face of an Italian attack at the Battle of Tug Argan in British Somaliland – only to be found later alive and well as a prisoner of war. Wilson was released from captivity when Italian forces in East Africa surrendered in 1941. He returned to active duty serving with the Long Range Desert Group in the Western Desert. Between 1942 and 1944 he fought in Burma with 11th (Kenya) Battalion KAR. South African farmer and later Australian politician Charles Groves Wright Anderson won the Military Cross for his service as a Lieutenant with 3rd (East Africa) Battalion KAR in the First World War campaign to capture German East Africa (later Tanganyika, now Tanzania). He went on to win the VC as a Lieutenant Colonel with the Australian Division in Malaya in 1942 during the Second World War. Lieutenant Colonel Derek Anthony Seagrim served a three-year tour with the KAR before the Second World War and went on to win the VC in 1943 by assaulting German positions on the Mareth Line in Tunisia, commanding the 7th Battalion, The Green Howards. Unfortunately, no VCs were awarded to African askari serving with the KAR – although there were undoubtedly incidents that deserved this highest award in both the First and Second World Wars. 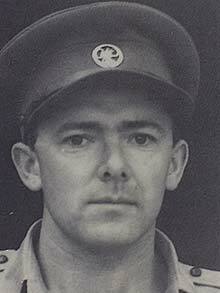 For example, Colour Sergeant George Williams of 1/3rd Battalion KAR was a Sudanese askari with an English name. Colour Sergeant Williams was recommended for the Victoria Cross by his Divisional Commander, Major General Tighe for extricating his platoon and a machine gun under heavy enemy fire at Jassin in the Umba Valley, in German East Africa (now Tanzania) in January 1915. 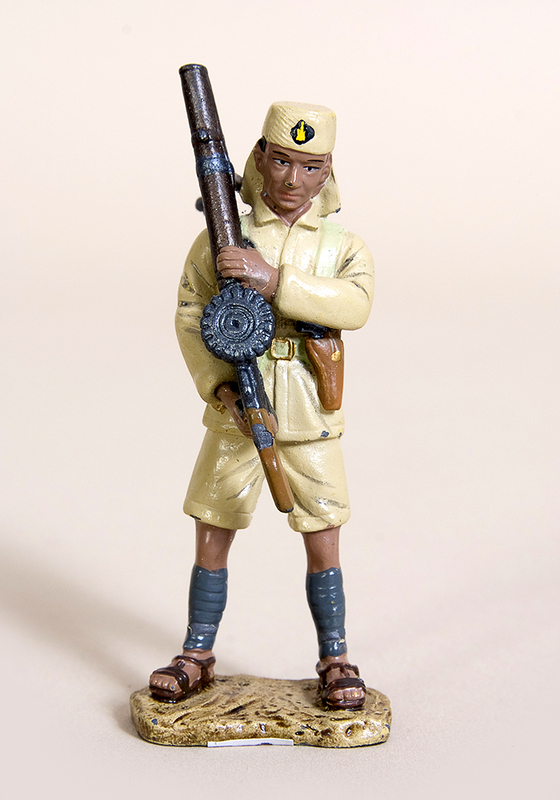 The modern model of a KAR machine gunner of the First World War by Del Prado (left) is an unwitting tribute to Colour Sergeant Williams’ bravery. Colour Sergeant Williams’ VC was not confirmed but he was awarded a Bar to the African Distinguished Conduct Medal (DCM) he had already won in 1914. 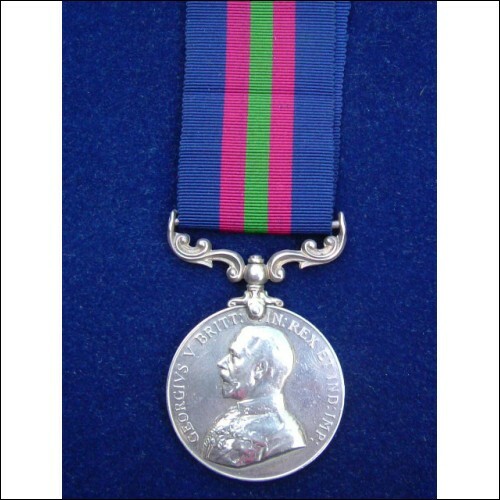 The African DCM – often called the King’s African Rifles DCM – was the medal most frequently awarded to African askari for gallantry in the face of the enemy. This medal was instituted in 1896 and continued until 1942 in the middle of the Second World War, when it was replaced with the regular British and Commonwealth DCM. Disgracefully, the Foreign and Commonwealth Office of the British Government has lost the Medal Roll for the African DCM, so only a few of these acts of heroism by African soldiers on Britain’s behalf are recorded for history. This entry was posted in Famous KAR Members, Modern Models by askari373. Bookmark the permalink.